A New Map of Arabia, including Egypt, Abyssinia, the Red Sea & c. & c. from the latest Authorities. 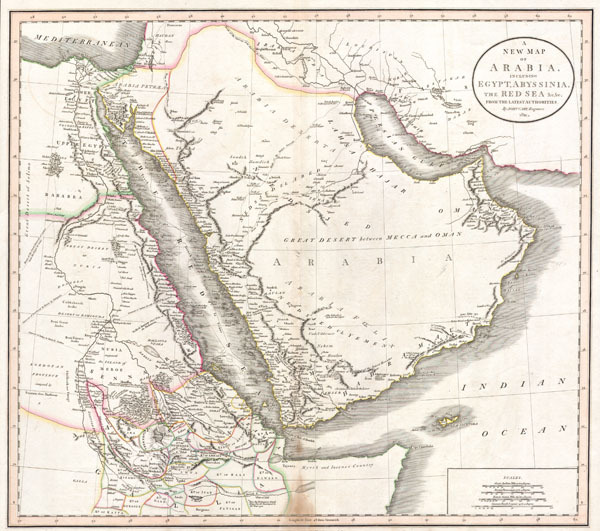 This is a stunning 1811 map of Arabia, Egypt and Abyssinia ( Ethiopia ) by English Cartographer John Cary. A smorgasbord of wonderful detail including historical notes, caravan routes, the locations of desert wells and oases, nautical routes, and tribal kingdoms. Contains such notations as 'Here the Portuguese found King David encamped in the Year 1520' , referring to the Portuguese embassy to the King of Ethiopia; 'Myrrh and Incense Country' on the Horn of Africa; and 'Supposed Island of Meroe,' referring to the ancient pyramid building culture in the heard of what is today Sudan. Also of interest is the route of the Frigate 'La Venus,' which charted the Red Sea, the Persian Gulf, and the Indian Ocean before disappearing in a hurricane with all crew and cargo in 1788. Dated 1811. Very good condition with wide clean margins. Minor discoloration on bottom centerfold – see photo. Original platemark visible. Blank on verso. Phillips, 714; Fordham, J.C. John Cary, p. 77-82; The map collector, 43, p. 40-47; National Maritime Museum. Catalog, v. 3, no. 311; Rumsey 1657.047.